Mike and Jo met years ago and the rest is hair history! Over the years they have teamed up educating together and even have written a cut and color book. Mike was born in New York and grew up in Switzerland. At the age of 15 he started in Zurich, Switzerland an apprenticeship in the most amazing industry. Right after that Mike moved to London for additional education with “Tony + Guy” and the “London Hair Academy”. In the early 90’s he relocated to Hollywood and on to New York to chase the big dream. 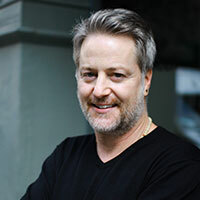 “It did not take long and I was cutting the hair of such silver screen legends and TV personalities like Sharon Stone, Marissa Tomei, Florence Henderson, Donny + Marie Osmond, Gina Lee Nolin just to name a few.” Mike’s vision, strong innovative drive and all of his experiences led him to manufacture his first DryHairCutting shear and the KARG DryHairCut was born along with education, DVD’s, books and of course the tools. Early 2000 he founded KARG Inc. in New York and KARG Hairstyling + Products in Switzerland. Mike can be found chopping heads in Dop Dop every other month!